Easter is about the gathering. 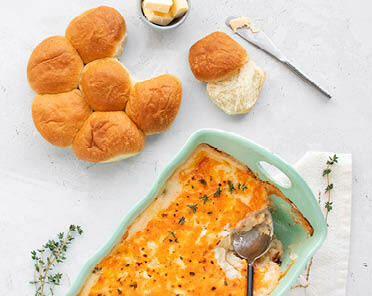 Whether you’re hosting a handful of friends or the entire extended family, a simple yet delicious menu is the key to help you spend less time preparing and more time enjoying Easter. 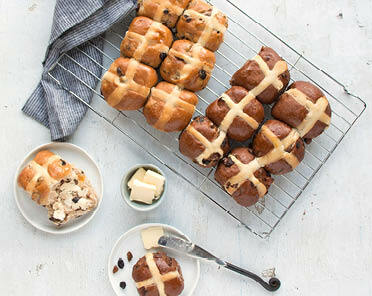 Here are our suggestions for an Easter dinner of any size. There’s nothing like ham for the holiday, and this year we’ve got something new in the meat department – Soleterra d’Italia Modena hams. These exceptionally tender hams are made in the new Soleterra d’Italia facility in Acme, Alberta with pork from Sunterra Farms. Modena hams are cooked without smoke for a deliciously natural flavour and smooth consistency that just melts in your mouth. 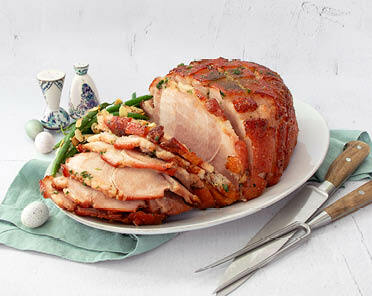 To cook, score the ham ¼-inch deep in a diamond pattern to help the glaze stick and create a crispy crust. Cover with foil and roast the ham at 325F until the internal temperature reaches 140F, then remove foil and brush liberally with glaze. Continue roasting until the internal temperature reaches 160F, basting with glaze as many times as you want. Each time you apply the glaze, the sugars will caramelize and create that mouthwatering, crackly crust that we all dream about. The more layers of glaze, the thicker crust you’ll have. You can make your own glaze or pick up market-made glazes like pineapple mustard, orange and brown sugar or maple ginger. For colour and crunchiness you can’t go wrong with green beans. This Easter we’re taking them up a notch with green bean amandine. Our recipe uses French beans, also known as haricots verts, which are thinner and shorter than other beans. They are wonderfully tender and an elegant choice for a feast. To make the sauce, toast some almonds in a shallow pan then add plenty of butter and a squeeze of lemon. Cook the beans al dente and top with the almond butter for an upscale side dish in a cinch. Find that recipe here. Now for potatoes we need ours scalloped because, well, what is Easter without a juicy, sweet ham and creamy, rich potatoes? Our Gruyère scalloped potatoes are made with layers of paper-thin potatoes,caramelized onions and scratch made béchamel sauce. The layers let the steam flow through to cook the potatoes evenly while the tangy Gruyère is melting on top. Once the potatoes are done, we add another layer of cheese and cook it au gratin for that irresistible layer of crispy cheese on top. It’s basically like having a fondue on top of potatoes and if there are people who don’t like that, we haven’t met them! This dish takes a bit of work so we recommend you pick up Gruyère scalloped potatoes in our kitchen delis and reheat at home. Each family has its own traditions, and Grandma’s overnight buns are one of ours. These buns are Sunterra Farms co-founder Flo Price’s original recipe and yes, they are made with lard so you know they’re going to be good. The dough itself is simple but the key is leaving it overnight to let the yeast do its thing, resulting in sweet, feathery soft buns. Serve with Riviera salted cultured butter for a savoury treat.